It’s never too late—or too early—help your kids set healthy boundaries with technology. You hear a lot about the serious consequences of unchecked exposure to TV, gaming, and computers—especially for kids. Too much screen time has been linked to poor fitness, poor nutrition (thanks to junk food ads), juvenile depression, social stress and lower performance in school. Teaching kids healthy tech habits might seem like an uphill battle, but the climb is 100% worthwhile. Since you might need to try a few approaches before you find a plan that works, here are some ideas to get you started. Grown-ups can model healthy behavior to kids by keeping their personal screen time in check. A great way to find that balance is by scheduling activities that put the focus on spending quality time together. For example, take evening walks, play ball in the yard or have a board game night. Members of the Y can also take advantage of free Kids and Family exercise classes. TV and video games can offer a sense of security for kids who don’t feel confident on the playground or in the classroom. Talk openly to your child about his or her insecurities so you can offer encouragement and suggest alternatives to “numbing out” in front of the screen. The Y’s Summer Programs are packed with hands-on activities and designed to make sure every kid feels welcome, supported and safe to try new things. Mapping out appropriate times for watching, surfing and gaming on the family calendar reminds kids that screen time is a privilege; not a right. You might give them the option to earn bonus online minutes if they log a certain amount of time outside, playing sports or doing their homework. Team sports make a great alternative to solitary, sedentary pastimes. 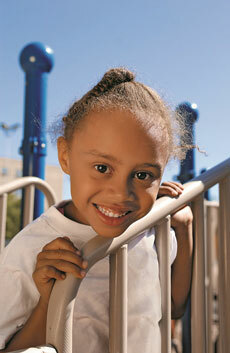 At the Y, our Youth Sports programs offers dozens of exciting options for kids of all ages. Some families observe weekly Zero Tech Days. Others take an entire week off from phones, computers, gaming consoles and e-readers (outside of school and work). However your tech vacation shakes out, get kids involved in brainstorming activities to fill time normally be spent online. They’ll learn first-hand that it’s possible to go for long stretches without logging on. Need some ideas for how to keep everyone away from their devices? Y Camps let kids and grown-ups reconnect with nature in beautiful settings, often far away from a WiFi signal! Whether it’s an achievement in a game, chatting with friends or finding out what happens in the latest episode of a favorite show, ask kids to explain what they hope to gain from their time online. Doing so encourages them to self-regulate—and express why their tech is important to them. Broaden the goal-setting exercise to other areas of interest. Maybe things they’ve seen online have sparked curiosity in art, archery or science. Help these interests grow with Arts & Humanities activities at the Y.